February 3, 1945 – The vice-president of the Chicago Motor Club, James E. Bulger, offers a suggestion for joining the proposed Illinois and Michigan canal superhighway (today’s Eisenhower Expressway or Interstate 290) to Michigan Avenue and Lake Shore Drive. The suggestion is an alternative to the route prepared by Allied Engineers, Inc. of Detroit which has the proposed expressway extending along Archer Avenue past South Halsted Street and then across the river at which point the road would take traffic northward where it would join proposed northwest and southeast highways west of the Loop. Bulger’s suggestion has an elevated roadway running along Archer Avenue to Cermak Road with an eastward extension connecting to Lake Shore Drive. This would save the expense of bridging the river. 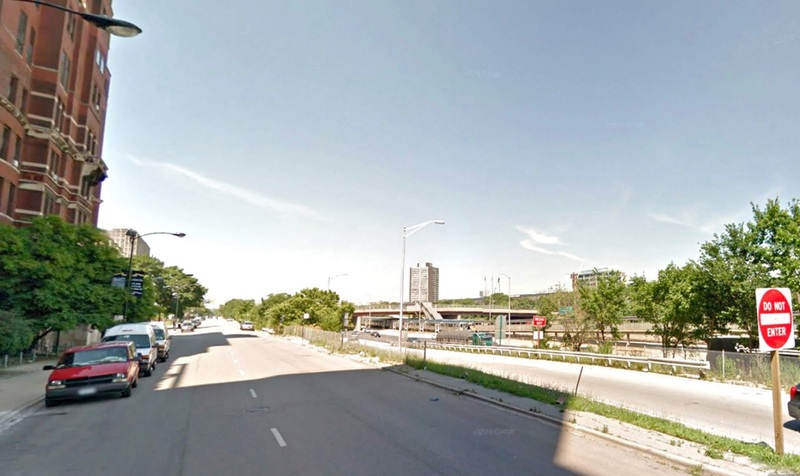 A third alternative, prepared by the Chicago Plan Commission, would see Franklin Street extended south to Archer Avenue as an elevated highway over railroad tracks east of the river. This plan is problematic because of the legal implications of building on air rights over railroad property. The highway was constructed between 1949 and 1961 at a cost of $183 million, a project that displaced and estimated 13,000 people and boarded up more than 400 businesses in the city. 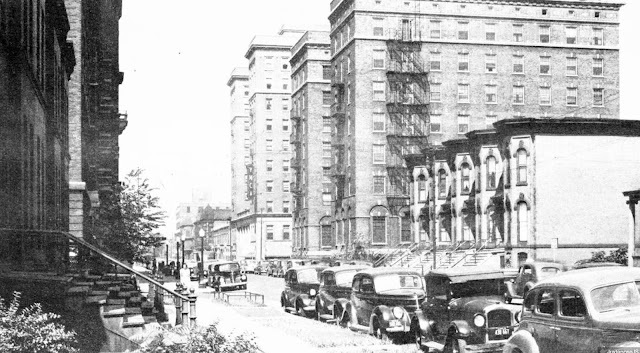 [interactive.wbez.org] The black and white photo was taken near Paulina Street on Congress Street, looking west. The second photo is from the same location and shows what the area looks like today. 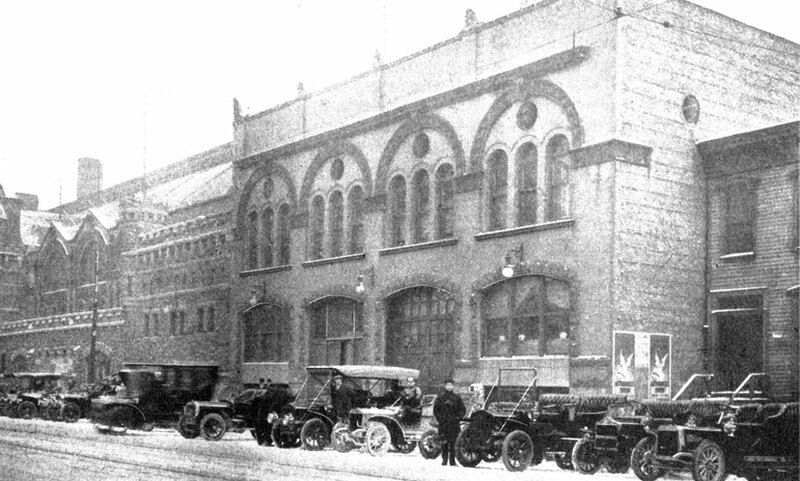 February 3, 1906 – At two o’clock in the afternoon both the Coliseum building and the First Regiment Armory open their doors for “the greatest display of automobiles ever seen in Chicago.” [Chicago Daily Tribune, February 3, 1906] Ninety-eight automobile companies and 140 dealers in automobiles and accessories are represented in the two buildings. Says one dealer, “Ten years from now you will see certain streets in the larger cities restricted entirely to motor vehicle service. You may think this is fanciful language, but the time is coming. The commercial automobile has grown more in favor during the last year than in the preceding five years. Good men are coming forward to apply for positions to drive these wagons, and with a supply of serviceable men to draw on, more firms will adopt motor vehicles to do their carrying. 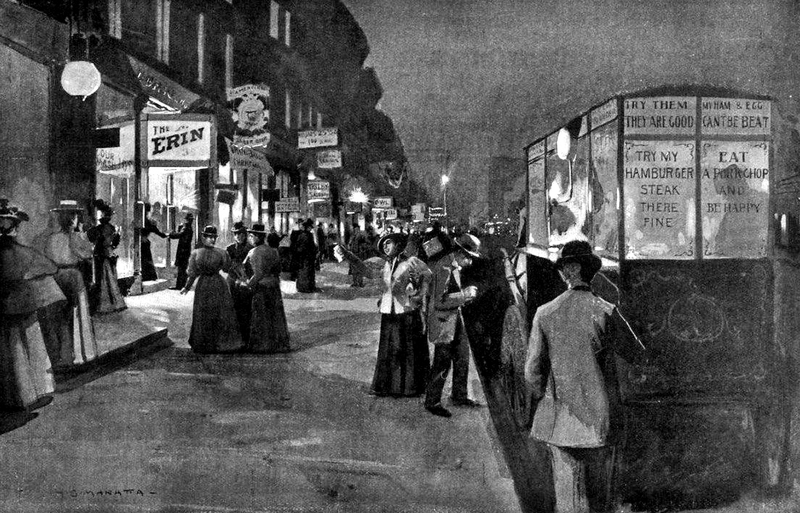 The motor car is a quicker and more economical delivery wagon than the horse drawn wagon.” As visitors from all over the Midwest crowd into the city’s hotels, attendance at the auto show is projected to be as high as 100,000. The above photo shows that not even a snowstorm could stop the show from going on as cars line up outside the Coliseum at Fifteenth Street and Wabash Avenue. Based on the routing, wouldn’t the I&M Canal superhighway be today’s Stevenson Expressway / I 55? I know the first few miles were built over the canal.